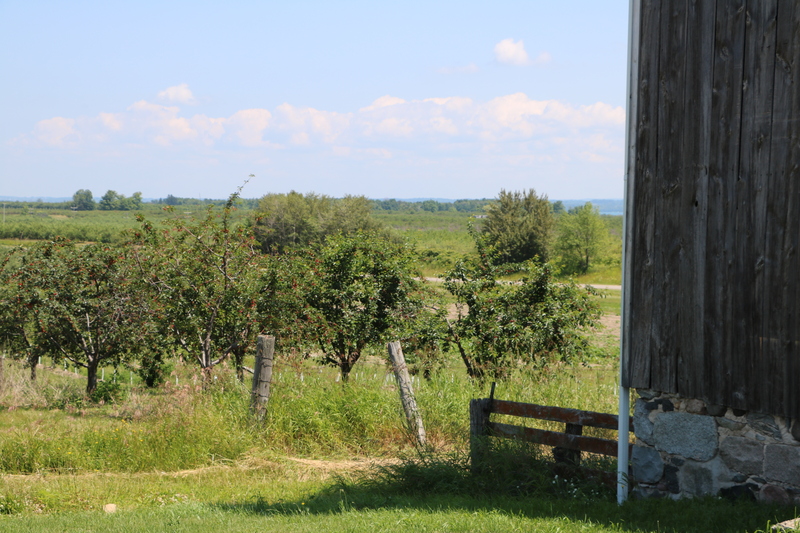 One of the best times we had this summer was picking our own cherries at Rennie Orchards. It’s about 15 minutes from our family lake cottage and 15 minutes away from Traverse City, Michigan. Caroline and Adam were spending the week with us and it was the perfect thing to do on a day that started out rainy, but ended up clear and sunny. 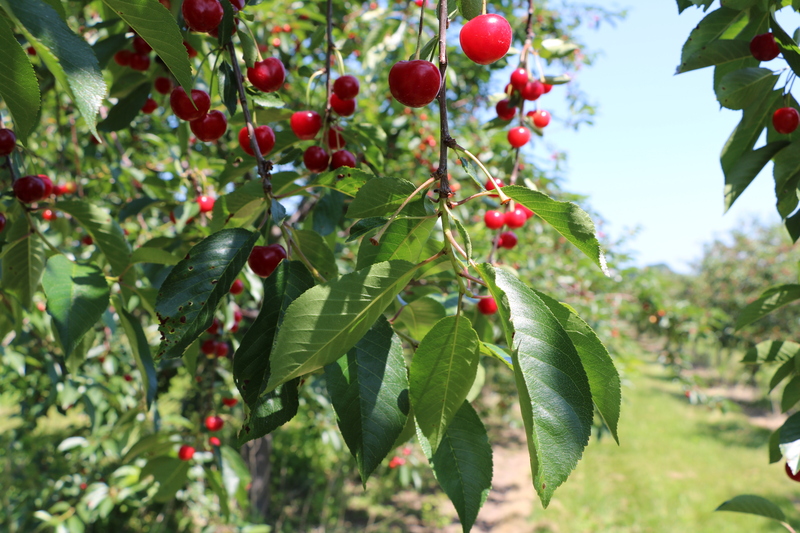 Everyone got a little bucket that would hold four cups of cherries – just the right amount for a cherry pie. The first one I made was so runny that it ended up being cherry sauce for ice cream. My mistake was not letting the cherry filling get thick enough, and then not waiting long enough for the pie to cool before cutting it. With the rest of the cherries we picked that day, I managed to master the thickness of the filling. But instead of pie, I made cobbler. I brought it to a pitch-in and got a thumbs up from our lake cottage neighbors. 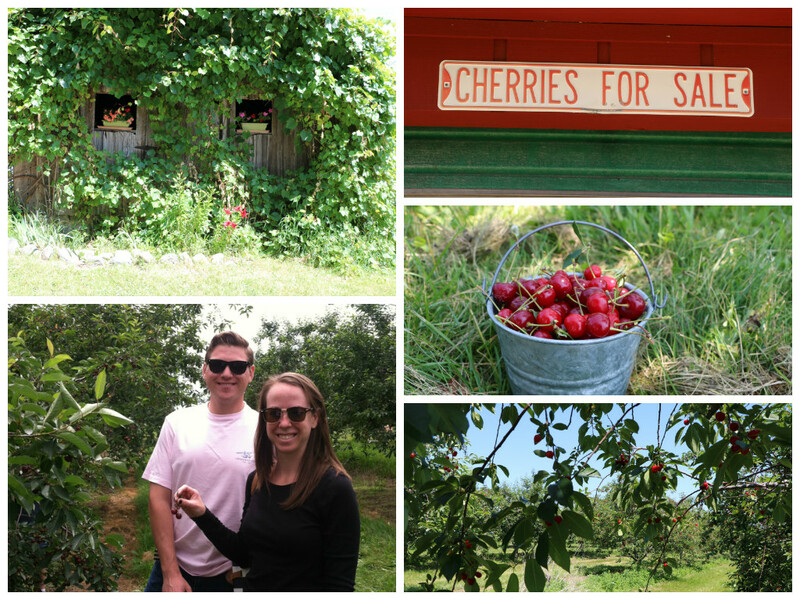 At the end of our stay, I talked Roy into going cherry picking with me again. 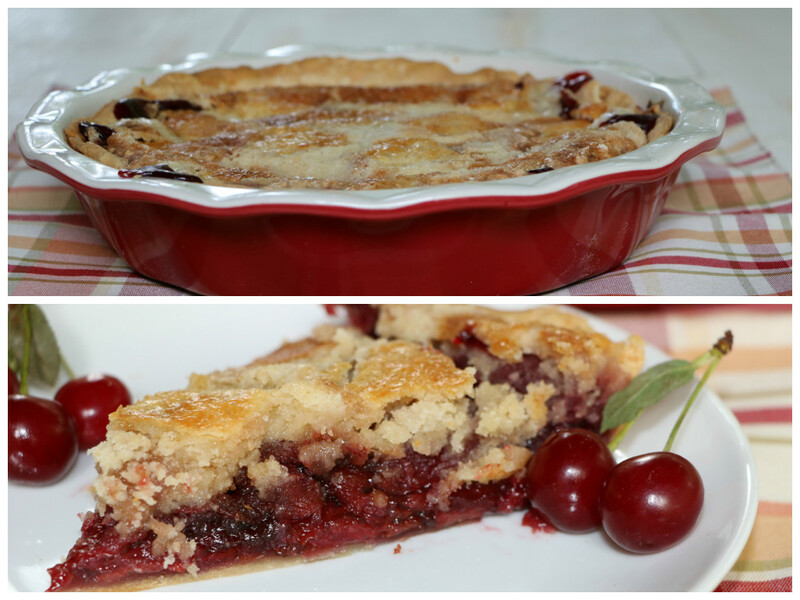 We brought the cherries home and I got the great idea of combining a pie and a cobbler. The recipe posted here makes a very decadent dessert! It’s especially good with a scoop of ice cream! Cut the butter into slices and place in a large bowl. Add the flour and salt. Use an electric mixer to combine all the ingredients so they look like crumbs. Then add the water a little at a time while using a fork to mix it it. When it forms a cohesive ball, it’s ready to be rolled out. Honestly, this takes patience. I place the dough on a floured surface such as a pastry cloth or board. Then I roll it out in all directions to make a circle large enough to cover the bottom and sides of my pie pan. When the dough cracks, I patch it up and keep going. I have even balled it up again and started over. The experts say that’s a no-no, but because this crust is so buttery, it’s never affected the flakiness or taste. 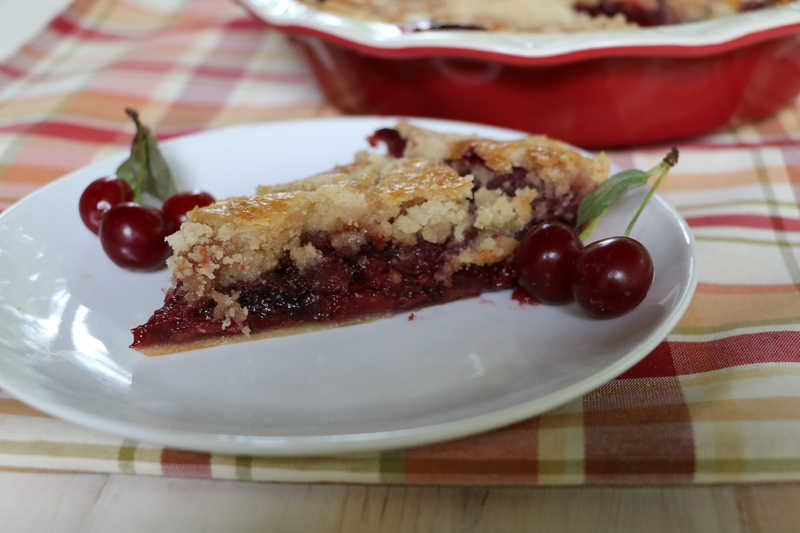 The main focus of this pie is the cherries and topping – not the crust. However, this crust really compliments the other two parts of the pie. When the crust is rolled out large enough, place it in the pie pan. Crimp the edges or cut off the excess if you are lucky enough to have that much extra dough. Set aside while you make the filling. Place the cherries in a medium sized pan, cover, and cook over medium low heat for 15 minutes. This releases the juice. Then add sugar and cornstarch. Also add the extract and lemon juice if using. Bring the mixture up to a boil, then turn the heat down to medium low. Stir often until the mixture thickens enough to cling to the spoon. This takes about 10 minutes but don’t walk away – the bottom can burn if not watched closely. When it’s nice and thick, spoon it into the pie shell and set aside while you make the cobbler topping. Mix flour, sugar, and vanilla together. Spread the dry mixture evenly over the surface of the filling. Cut the butter into slices. Arrange the butter slices on top of the dry mixture. Bake the pie in a preheated 375 degree for 1 hour. The topping should get nice and brown, but will be uneven in coloration in some spots. 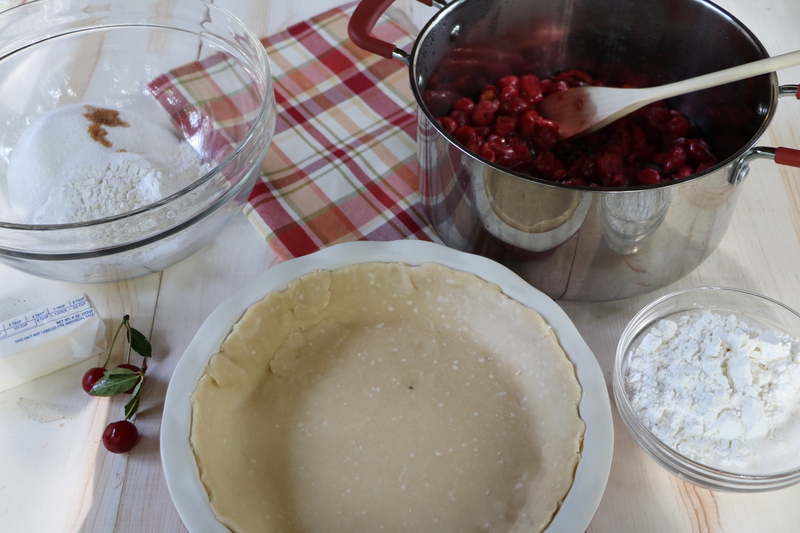 Allow the pie to cool before slicing. At the risk of not sounding very modest (!) – it really is sooooo good. Even if someone used a can of cherry pie filling and just made the topping, it would be an amazing dessert!